Bari, which lies in the Puglia, or Apulia, region of southern Italy (around the heel of the country's "boot" shape) is the kind of port cruise passengers dream about. It boasts a delightfully sunny, palm-lined promenade and broad boulevards with designer shops and top-quality restaurants. And, its lovely medieval Old Town is so atmospheric it could be the set for a particularly romantic version of "Romeo and Juliet" with its balconied houses, pretty courtyards, Baroque and Romanesque churches, chapels, shops and courtyards. Beyond the city itself lies beautiful Puglia, which is endowed with a sandy coastline, 60 million olive trees, Roman ruins, vast golden wheat fields and the distinctive whitewashed, grey, conical-roofed houses known as the Trulli. Bari is growing in popularity as a cruise port. Big-ship lines -- including P&O, Costa, Royal Caribbean and Celebrity Cruises -- are now visiting there, in addition to the small, upmarket ships of Seabourn, Silversea, Azamara and Oceania Cruises. This is one port guaranteed to deliver a memorable day ashore -- and even have you planning to come back for a longer visit. Bari has three separate docks for ferries, container / freight vessels and cruise ships. We were greeted on arrival at the cruise dock by a small blue terminal with a big, friendly "Welcome" sign on the outside and passport control desks inside. Behind the terminal area was an open seating area, somewhere quiet to sit and wait for tour buses. And, behind that was a much larger, two-story terminal with check-in desks on the lower floor and a souvenir shop, lavatories, drink machines and a newsstand on the upper level. There's no ATM, though; that's in the bank inside the docks. Bari has the longest seafront in Italy. It's also one of the prettiest, dotted with elaborately styled, elegant, black wrought-iron street lamps and planted with palm trees. Head left along the promenade from the dock gates, and across the road you'll see a grassed-over dry moat surrounding the old city walls, with a few restaurant and cafe tables laid out, should you need a quick drink or snack. Italian traffic can be very daunting, particularly in the narrow streets of the Old Town, where you'll need to keep your wits about you if you don't want to collide with a speeding Vespa (or, as in my case, have a near miss with a cyclist). As with most big cities, Bari can be a hunting ground for pickpockets, so keep bags and pockets well-buttoned, and don't carry too much cash or expensive jewelry. Bari's Old and New Towns are easily walkable from the port. To reach the Old Town, head left along the promenade, and after about 10 minutes, you'll see a broad archway set into the old walls; this is the entrance to Bari's Old Town. Some cruise lines provide free shuttle buses from the dock gates down to Avenue Corso Cavour, one of the main shopping streets in the "new" part of Bari. It's easy to walk from there back to the cruise terminal via the Old Town by strolling east along Corso Cavour to Piazza 4th Novembre and then walking left along the main street, Corso Vittorio Emanuele, which divides the Old Town from the new. If you don't want to walk or take the shuttle bus around town, you'll find mini-train tours on offer right at the dock entrance. Trenino-Tour offers 1.5-hour Bari City Tour drives around Bari's harbour, Old Town and main sights. Eventieturismo offers one-hour tours. Taxis are also based at the dock gates. They are metered, but roundtrips to local places of interest can be negotiated separately with waiting time. Currency is the euro; see www.oanda.com or www.xe.com for the latest conversion rates. You'll find an ATM machine right in the port where you dock. Look for the Banco Populaire di Bari, a squat cream building that lies about a two-minute walk to the left of the port entrance, within the perimeter fence. Italian is the official language. Don't assume you'll find English-speakers, so take a phrasebook along, or at least memorize a few basic phrases like hello (buon giorno), thank you (per favore), how much (quante'e) and I don't understand (non capisco). 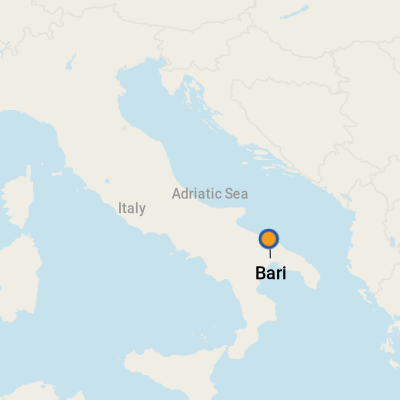 Bari's cuisine is one of the most traditional and delicious in Italy, and it's based on the three main agricultural products of the Puglia region -- wheat, olive oil and wine -- supplemented by locally produced fruit, vegetables and meat. It's a foodie's paradise; look out for that glorious traditional pasta (particularly the hat-shaped orecchiette), and tuck into pungent baked calzone, made from local flour and filled with onions, anchovies, capers and olives. Dip focaccia alla Barese into thick minestrone soup, or enjoy a ragu of lamb, pork or (if you're feeling brave) horsemeat. And, if you're feeling even braver, try the catch of the day served tartare. (Yes, that means raw.) Or, enjoy a traditional, oven-baked Riso -- composed of rice, potatoes and mussels -- washed down with some of the delicious local wines, such as Primitivo. You'll find good places to eat in both the Old Town and the new. Corso Vittorio Emanuele, the broad main street that divides Bari's Old Town from its 19th-century area, is the best place to head if you fancy a traditional Italian lunch ashore. The central, pedestrian area is shaded by palm trees, and it's a good place to browse for a nice lunch venue, as you'll find plenty of enticing restaurants with pretty, glass conservatory-style frontages. Best for Local Dishes: Terranima Ristoro Pugliese (213 Via Putignani) comes highly recommended. Filled with antiques and old street signs and designed to resemble a market square surrounded by local shops, it offers a range of locally sourced food and fragrant Puglian wine. Specialities of the house include homemade fusilli pasta with courgettes (zucchini), a gut-busting antipasti platter that features local ham and three types of cheese, tasty frittata (thick omelets) and cheesy fried potato puffs. Best for a Sophisticated Meal: Ristorante Alberosole (in Corso Vittorio Emanuele II, near Piazza Ferrarese) is noted for its sophisticated twist on traditional Bari dishes. With its monastery-style vaulted roof and stone-flagged floor, it's also an atmospheric place in which to dine. House specialities include a crescent-shaped pasta dish, spiced up with mint, anchovies and pine nuts; orrechietti (ear-shaped) pasta with bacon; and locally caught squid, stewed in red wine. Best for an Inexpensive Lunch: Caffe' Borghese (130 Corso Vittorio Emanuele) is a good bet for an affordable meal. Order a drink, and you'll get a few nibbles thrown in for free, while the filled panini and bruschetta -- substantial hunks of bread topped with tomatoes and garlic -- come highly recommended. And, you can either eat in the elegant brasserie-style interior, or sit outside and watch the world go by. Puglia is famous for its handmade pasta, which you'll find in many unusual shapes, like tiny leaves, Mexican sombreros or minuscule, hand-rolled cigarillos. Indeed, these pastas -- in shades of palest ochre, pistachio, cafe creme and sun-washed terracotta -- are so pretty that I'd rather decorate my kitchen with jars of them than cook them. That said, the local pasta dishes taste as good as they look (see Lunching section). Named for an ancient tribe that lived along the eastern coastline of the Adriatic Sea in the first millennium BCE, the Dalmatian Coast is best known as the place the white and black spotted dog came from. But with a history that dates back to a time before the Greeks and includes long sweeps of time under the rule of various empires (Roman, Byzantine, Venetian, Yugoslavian), there's so much to learn about and see in any of the cities and towns that dot the area's islands and coastline. The Dalmatian Coast stretches southeast from Italy's Venice (rulers from here used to oversee this part of the world), encompassing Croatia and parts of Slovenia, Bosnia and Herzegovina, and Montenegro. 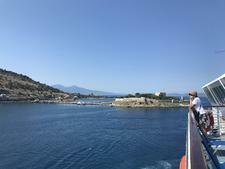 The ports are often visited as part of Eastern Mediterranean itineraries (although it's technically on the Adriatic Sea), as well as by small ship cruise lines that stop at smaller cities and towns exclusively along the coastline. 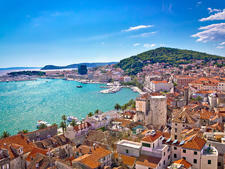 Whether you sail an itinerary that sticks exclusively to the Dalmatian Coast or a Mediterranean journey that stops at select ports on the way to elsewhere, you'll visit towns with quaint old city centers, narrow stone streets, medieval fortified walls, cathedrals that span hundreds of years and subtle signs of the war that raged through this area in the mid-1990s. With excursions on offer that range from classic city tours and culinary tastings to hikes or kayak trips through pristine natural environments, a cruise along the Dalmatian Coast offers a rich experience to history buffs, foodies, active travelers and anyone who simply wants to explored a less-traveled path. The Black Sea is one of cruising's best-kept secrets. 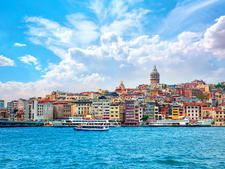 Get Black Sea cruise tips, Black Sea cruise planning ideas and find the best time to go on a Black Sea cruise. A cruise is the best way to experience the Greek Islands and its treasure trove of whitewashed villages, picture-perfect beaches and ancient ruins that transport you back to a time when Olympian deities ruled the world. For those who are more budget-conscious, it's hard to beat the value of Celestyal Cruises' weeklong itineraries offered on its Celestyal Crystal cruise ship.